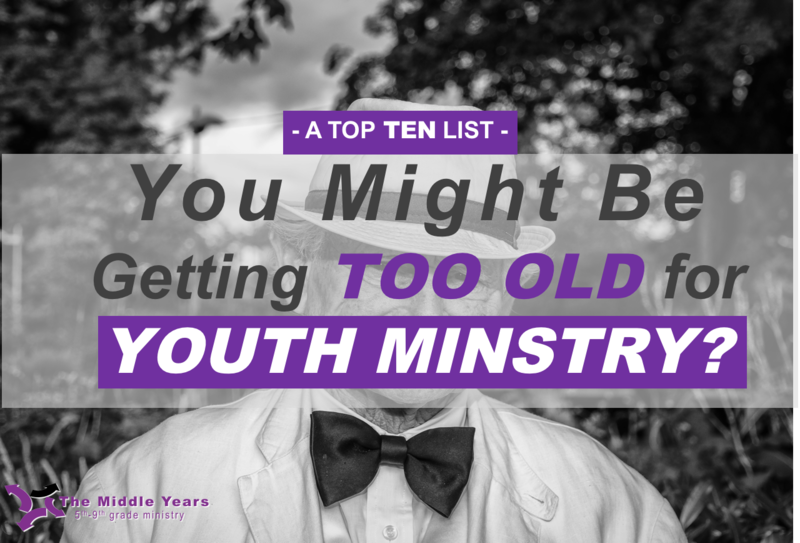 The Middle Years : Top 10: You Might Be Getting Too Old for Youth Ministry? Top 10: You Might Be Getting Too Old for Youth Ministry? People ask me, how to you know if you are getting to old for your youth ministry. Even in my most recent interviewing process, as churches discovered my age, there were questions. 10. You had to stop drinking Red Bull, because it is messing with your pacemaker! 9. Your typewriter broke and you don't have handouts for this week's lesson? 8. You have ever lost your teeth during a big moment in a lesson. 7. You have contemplated a new game called "chubby prunes". 6. You think Lady Gaga invented Gaga Ball! 5. Your cool edgy band stickers are now on your walker. 4. Your tablet is so old it is made out of stone? 3. You had to start wearing depends whenever your group plays "poop deck"! 2. You have ever been asked whose grandpa are you? 1. When students refer to the text you actually think they are talking about the Bible?! !